Range Rover Grilles, Vents, Parts & Accessories. VW Transporter T5 & T6. > Range Rover Sport (05-09). > Range Rover Sport (10-13). Bentley GT/C & Flying Spur. TPi Nut & Bolt Covers. Browse the shop for the best quality parts. 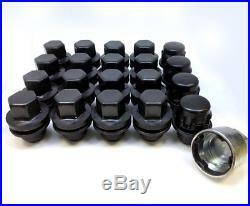 Genuine Land Rover Black Locking Wheel Nuts & 16 Nuts 14x1.50 Discovery 3. Quality and service means everything to us. Items dispatched same day if ordered before 3pm. Item 4 BLACK FINISHED GENUINE Land Rover LOCKING WHEEL NUTS 16 GENUINE BLACK FINISHED Land Rover Wheels Nuts to fit LM322 Range Rover wheels from Range Rover Sport and Discovery 3 or 4. We have commissioned a limited run of BLACK finished nuts. These are not available from Land Rover. DO NOT MISS OUT ON THESE! Ideal for fitting Later wheels to the P38. WILL NOT FIT OLDER THAN 2005 LM322 Series wheels. PLEASE NOTE - you must match the correct nut with the wheel you intend to fit. The thread type is the same on the Sport, LM Series and Discovery II/III. 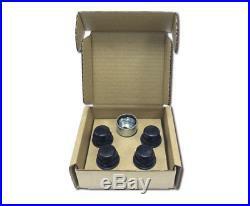 4 BLACK FINISHED GENUINE Land Rover LOCKING WHEEL NUTS & 16 GENUINE BLACK FINISHED Land Rover Wheels Nuts. To fit LM322 Range Rover wheels from Range Rover Sport and Discovery 3 or 4. Excellent customer care and aftersales are our priority. The parts we provide are replacement compatible pattern spares. HAWKE do not represent any OEM in any way and are a fully independent company. Any reference to OEM names or OEM product identification descriptions/model numbers is for identification only and does not indicate that it is an OEM part unless otherwise confirmed as such. On receipt of cleared funds, we will dispatch your goods the same day. We use Interlink Express for our NEXT DAY UK mainland deliveries. We can cater for either express or economy deliveries overseas. Our experience is that Europe by road is the most cost effective way to send. We will do our utmost to track your order for you. Please help us to help you achieve this. We are nice guys and are here to help! Fraudsters will be dealt with through the courts. Retention of title remains with sixonetwo until goods are paid for in full. Full terms and conditions are available on request. In the unlikely event there is a problem with an item bought from us, we're on hand to help. We are keen to help and get the job right. This section is designed to help you understand what jobs our products do. We're on hand to help. When fitting Spacers to your car, you'll need to extend the length of the bolt from the standard length to: standard length + spacer width. For example if your car takes a standard 28mm bolt and you use a 20mm spacer, you'll need to bolt the spacers on with 48mm long bolts. This needs to be an accurate measurement with a digital gauge. We'll happily do this for you if you bring a wheel to us. If the bore is very close to the hub size of your car, then it may be that rings are not available. In this case it's often possible for the wheel bores to be precision machined to a larger size (at additional cost) for which there are rings available. If you're in any doubt, give our experts a call. TPi locks are made to fit both your vehicle and your wheels. For example: tapered (cone shaped), radius (ball shaped) or mag seat (flat seated) If you've changed your wheels from the standard factory ones, then there's every possibility the nuts or bolts will need to be different - and the same applies to the locks. The diagrams to the right should help to explain the difference. TPi Race nuts and bolts are available in tapered fitment only. Please check below for the correct fitment for your car. Don't use the wrong seating type for your wheels. Don't take chances with your safety. These must be tightened with a bar and not by a nut gun, which will damage the finish. SD TUNER NUTS & BOLTS. You need these if your car requires nuts, and the bolt pockets on your wheels are too small for a standard socket. The same applies if your car requires bolts, and the bolt pockets on your wheels are too small for a standard socket. TPi bolts are made to fit both your vehicle and your wheels. For example: tapered (cone shaped), radius(ball shaped) or mag seat (flat seated) If you've changed your wheels from the standard factory ones, then there's every possibility the bolts will need to be different - and the same applies to the locks. If your bolt pockets are smaller than standard and too small to accept a standard socket, then. Youll need our spline tuner bolts. We can guide you towards to correct fitments for your car and wheels. TPi nuts and locks are made to fit both your vehicle and your wheels. Also that your wheels have tapered seated (cone shaped) bolt pockets. If you've changed your wheels from the standard factory ones, then there's every possibility the nuts or bolts will need to be different - and the same applies to the locks. Youll need our SD tuner nuts. 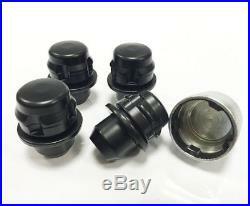 Our Premium quality plastic wheel nut/bolt covers to hide the decayed original ones on your car. Fit snugly over the top to improve the look of your wheels. These will not fit locking wheel nuts/bolts. You may also be interested in. 20 GENUINE Alloy Wheel Nuts To Fit Range Rover LM322 Sport Discovery 3 4 22.5mm. Genuine Land Rover SINGLE Alloy Wheel Nut 14x1.50 Range Rover Sport L494. TPi wheel location spigot Reducer rings 72.6mm - 70.1mm. Genuine Land Rover SINGLE Alloy Wheel Nut 14x1.50 Range Rover Vogue L405. The item "Genuine Land Rover Black Locking Wheel Nuts & 16 Nuts 14x1.50 Discovery 3" is in sale since Wednesday, November 09, 2016. This item is in the category "Vehicle Parts & Accessories\Car Wheels, Tyres & Trims\Nuts, Bolts & Studs". The seller is "sixonetwo_ltd" and is located in GB. This item can be shipped to all countries in Europe.